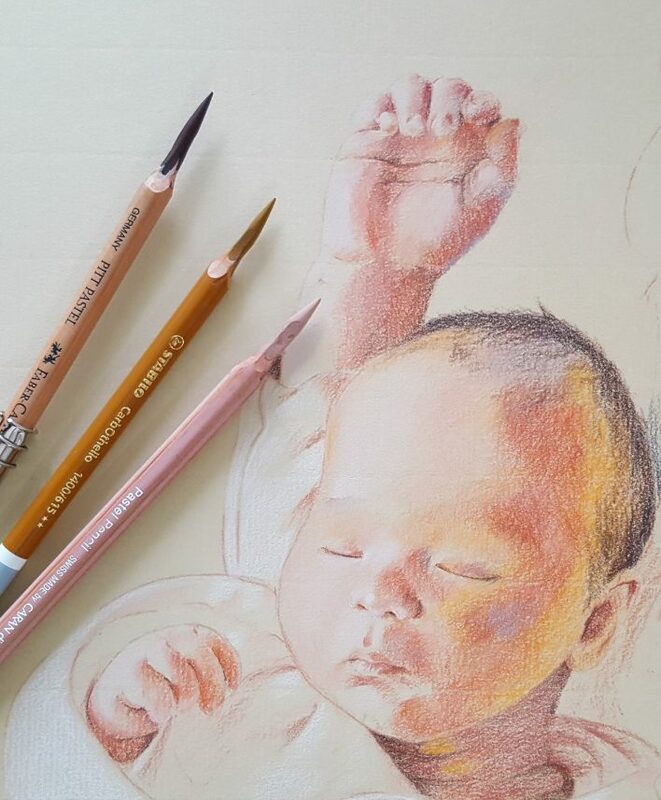 The quest for the best brand of pastel pencil for portrait drawing is a subject I have seen discussed all over the web, and, in my search for the ideal tool, is something I have researched extensively. 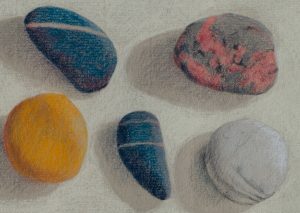 However, my choice of pastel pencil will vary from other artists’ as I don’t limit myself to a single brand. Buying (or receiving a gift of) a tin of pastel pencils, to get you started, is a common reason for singling out a particular brand. This may appear economical but it is worth considering starting with a selection of open-stock pencils and adding to your collection as needed. In buying a set, you will always be left with colours that sit unused for years. And conversely, however big a set you buy, you will always be left wanting. 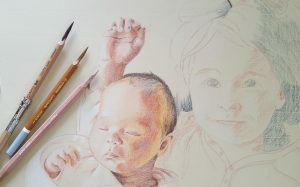 Following the advice of other artists (Colin Bradley, Art Tutor and others) I bought a good selection of portrait-type colours in Faber-Castell Pitt Pastel Pencils. I find them firm enough to allow good control and with a decent amount of pigment. They are certainly a good choice and have a reasonable range of colours. But, they’re not my favourite. Actually my least favourite. As well as the core often arriving shattered, these are hard and scratchy with an apparently high chalk content. I will avoid in future. My regular online supplier, Jackson’s offer an excellent choice in open stock, so I have tried quite a few. However, my modest collection of Derwent pastel pencils originates mostly from tins I bought long before I had the world wide web of pastel choice available to me (yep, that was a very long time ago!). As you might expect, they haven’t aged well. They are dry and brittle, and it wouldn’t be fair to give the brand a bad review based on my decades old collection. I have, however, bought a few Derwents from Jackson’s in recent weeks and I’ll let you know, just as soon as I’m able to form an opinion. These pencils are a work of art. They are so beautiful I want to eat them! With their bleached wood finish and dipped end of colour, they do for me what sweets must do for most children. The pastel itself is just as delicious – no I haven’t tasted it, but I’m tempted! They sweep onto the page like butter and are highly pigmented. But… a yummy tool experience does not necessarily equate to a good drawing implement and I’m afraid I generally find these too soft. Their high colour value and luscious choice of hue means I find myself choosing this brand just for the colour. The softness feels nice but isn’t practical as it leaves an uneven texture which is especially fiddly for smooth skin or hair. My solution is to lay the Caran d’Ache colour down, however unevenly, and almost burnish it to a smooth finish with a harder (Pitt) relevant shade. My collection of Bruynzeels is very small and the only experience I can report is that they are brittle and I have found them almost impossible to sharpen. More research is needed though and I will be back with more information when I have it. Often softer than Pitt, and brighter too, these are usually my favourite. Some of the colours, such as orange and caput mortem, I could not live without. However, as I implied, quality of the core is inconsistent as the texture of Carbothello varies between colours. Caput mortem has a distinctive mid-tone hue and I always use it for drawing out the line but it is a bit harder and more scratchy than the equivalent Pitt colour, so for rendering a smooth texture I am more inclined to use the Pitt. I have given you so many options and no definitive answer. So which should you use? Which do I use? Each has its own benefits and pitfalls. I would always suggest trying as many different brands as you can. The way to do this without costing a small fortune is to write yourself a list of the types of colours you need, eg, dark red, ivory, pale pink, yellow ochre etc and then go through the open stock of each brand selecting only one or two from each colour-type, but spread your choice over 5 or 6 brands. You will soon come to know the textures and ease of use for you and like me, you will probably find the right choice of pencil for you is all of them!